It's called "Illusion" because what look like curves are straight-line stitches! We adore lilacs and all things that come with lilacs—wonderful shades of purple and lavendar, delicious perfume-like scents, sweet butterflies dancing around the blooms—there’s even a “Lilac Festival” early each summer on nearby Mackinac Island! But we especially adore fabulous fabrics that feature lilacs and this new collection from designer Jackie Robinson of Animas Quilts and Benartex Fabrics makes us very happy indeed! 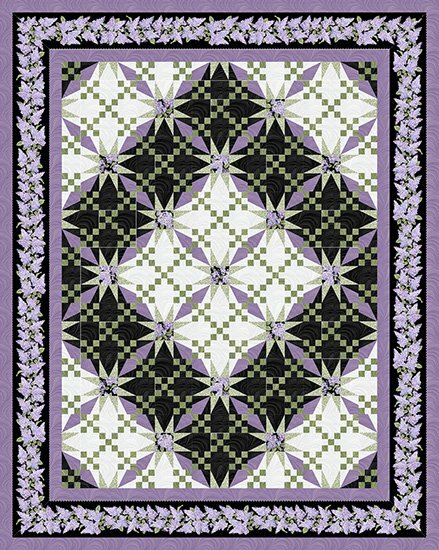 Featuring “Lilacs in Bloom,” a brand-new fabric line from Benartex designed by Jackie Robinson, the pattern can be made in four sizes. We'll ship you a kit in the size you order, and all sizes will be available on our website. Don't forget to check out yardage or coordinating 108" wide quilt backings to complete your project! The twin quilt requires 5-1/2 yards of 42"-44" fabric (sold separately). Please remember that shipping will begin in either August or September, but your credit card will be charged immediately if you order on our website. If you would like to order a kit, but would rather not have your credit card charged before your shipment is sent, please call us at (231) 537-2189, Tuesday through Saturday, 10:00 am to 4:00 pm (EST), and we'll happily assist you personally.